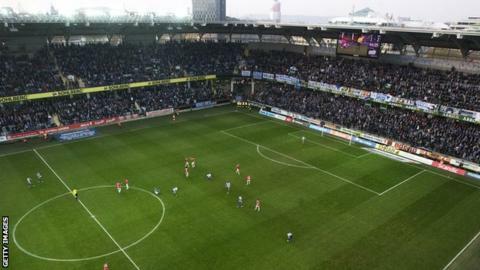 A Swedish top-flight fixture between Gothenburg and AIK has been postponed after an alleged match-fixing attempt. The Swedish Football Association claims an AIK player was "offered a considerable sum" if he contributed to losing Thursday's Allsvenskan game. General secretary Hakan Sjostrand described it as a "very serious attack against Swedish football", adding: "We will never let this happen." Police in Sweden have started an investigation into the allegation. "It is ultimately not about a single match, therefore it is important we act forcefully," added Sjostrand. "The starting point for all of our games is that they are safe and settled on sporting grounds. Based on the information we have, we cannot guarantee that." The two sides have played eight games in the Allsvenskan this season, with AIK sixth in the 16-team table, five places above Gothenburg. "This has been the first instance of alleged match-fixing in the top league level that we have heard about - it has happened quite a bit in lower league football and in basketball. In 2016, the Superettan [second tier] had 43 instances of players participating in match-fixing, but for it to rise to this level is really quite surprising. "The secretary general of the Swedish Football Federation say they have worked hard to educate players about what to do if they find themselves in this situation, and that's one of the reasons this was nipped in the bud."